As the seasons change, so can our homesteads. We now have a number of designs and effects that we can use on our homesteads, some can be purchased in the Market, others come from decorations that we've placed there. Some grounds are available to us all, others are unlocked as mission rewards. They are all purchased in the Market (for a modest amount of coins) once unlocked. To change your homestead, find the ground you want and purchase it in the market. Use the names listed below to search for it. Visit a neighbour and refresh the game to see your new ground in all its splendour. The one we all start the game with. 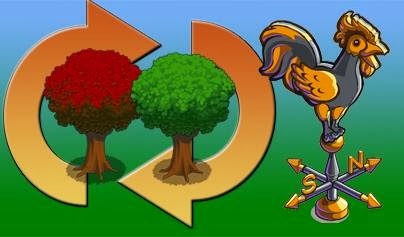 We can also customise our homesteads using decorations earned as mission rewards to produce different seasonal effects. If you've finished the relevant missions and haven't yet used the decoration, check your inventory. If you used it and stored it, check your Expanded Shed. A decoration that allows us to change some of the homestead's lumber trees to match the seasons: red and golden leaves in autumn, snow-capped ones in winter, leafy green in summer. It comes from the Harvest Festival missions and is the mission reward for completing the Monday wrapper. It's upgraded to include Winter Trees via the Holiday Giving Missions. A decoration that allows us to toggle between falling snow and not. Scrooge's Shop comes from the Christmas Carol missions and is the mission reward for completing the main mission thread. A dramatic decoration that allows us to have volcanic ash falling down on our homesteads. 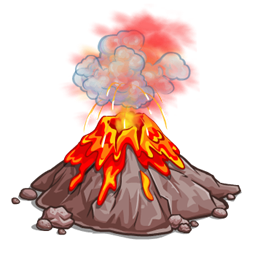 The volcano comes from the Volcano missions (no surprises there then!) and is the reward for completing the Monday wrapper. We can now edit the sky too, see HERE for details.